You probably remember KTVU’s royal eff up with reading obviously fake Asian names for the pilots of the Asiana crash. Names like “Wi To Lo” and “Ho Lee Fuk”. It looks like a Korean news agency is having some fun at KTVU’s expense. 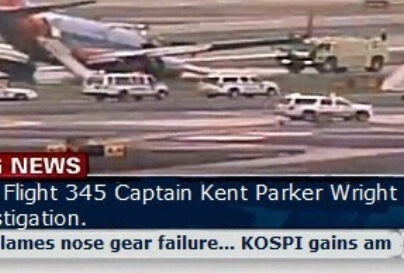 After the landing gear failure of the Southwest flight at LGA they showed this graphic with American pilot names “Captain Kent Parker Wright”, “Co-Captain Wyatt Wooden Workman”. They even went as far as making up fake names for people to interview. Flight instructor “Heywood U. Flye-Moore” and skeptical passenger “Macy Lawyers”. Well played Korean TV, well played. Korean News Station Pokes Fun at KTVU with Fake American Pilot Names After Southwest Airlines Landing Gear Failure « slothed.